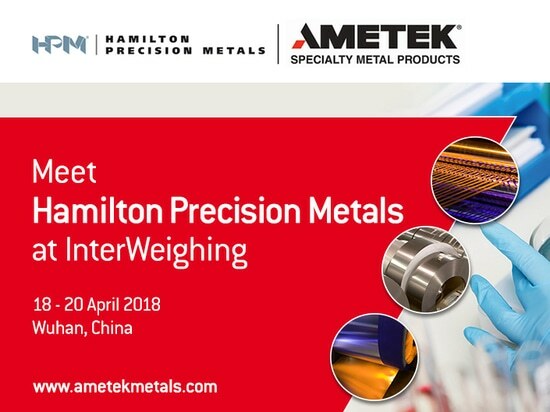 Hamilton Precision Metals, part of AMETEK Specialty Metal Products, will be exhibiting at InterWeighing 2018. Being held from April 18th to 20th at the Wuhan International Expo Center Hall in China’s Hubei Province, InterWeighing is the largest trade show in the world specializing in weighing instruments. It has been organized by the China Weighing Instrument Association (CWIA) since 1995 and covers the full range of automatic and non-automatic weighing instruments, including the load cells and other components and materials used in their manufacture. 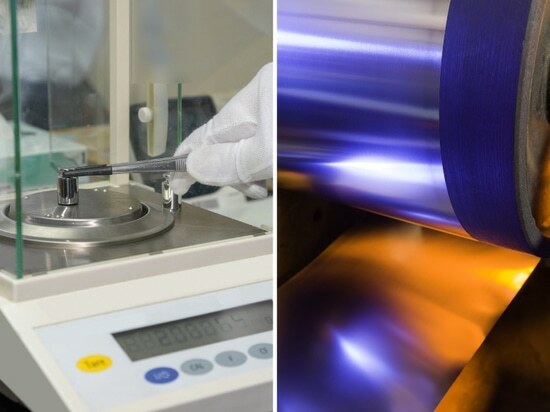 Hamilton Precision Metals is one of the world’s leading producers of rolled strip and foil in a wide range of alloys and specialty metals to some of the tightest tolerances and thinnest gauges in the industry from 1.5mm (.060”) to 1.5 microns (.000060”) in thickness. 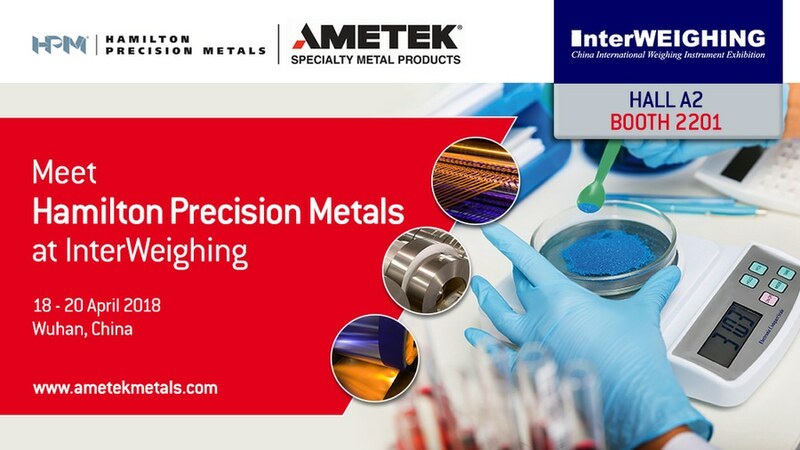 Instrumentation & Measurement has long been one of the major markets for Hamilton Precision Metals and at InterWeighing 2018, the company will be highlighting its particular expertise in the rolling of the precision resistor alloy foil, to exact customer requirements, used in the manufacture of strain gauges which serve as the active element in load cells and other load- or strain-sensing applications. Specifically, Hamilton Precision Metals will be promoting its Evanohm® R product, a unique nickel alloy with the best thermal coefficient resistivity (TCR) and inherent corrosion resistance, is ideally suited to strain gauges for the pharmaceutical market, one of the biggest markets for the company in China. 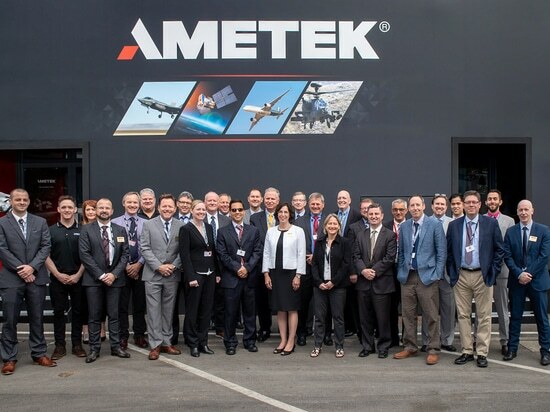 Other products being promoted will include Constantan, stainless and heat resisting steels, platinum-tungsten, other nickel-base superalloys, titanium and cobalt-base superalloys for a wide variety of applications such as sensor diaphragms, magnetometers, transducers and EMI/RFI shielding for Electronic and Instrument Enclosures. 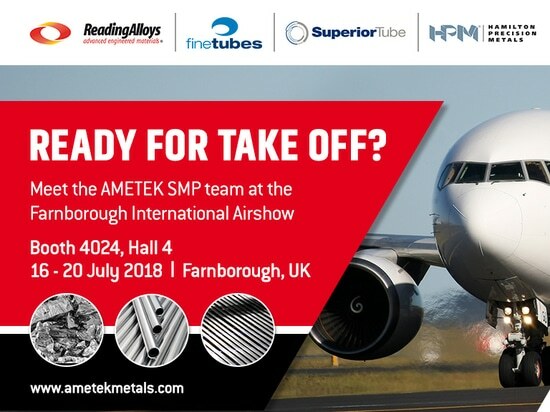 Through its key brands - Reading Alloys, Fine Tubes, Superior Tube and Hamilton Precision Metals - AMETEK Specialty Metal Products (SMP) has been serving the aerospace industry for more than 75 years.